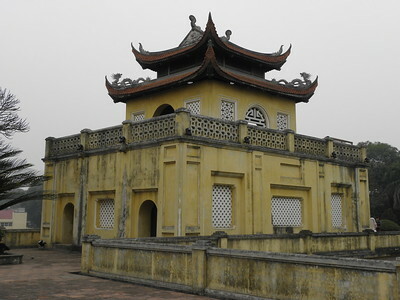 The Central Sector of the Imperial Citadel of Thang Long-Hanoi is the archeological site of the old capital of Vietnam, which originated in 1010. This makes it one of the oldest centers of power in the world that has been in use without interruption. Most of the structures were destroyed in the 19th century and are now being restored. They form a unique synthesis of the influence of various Asian cultures. This is a curious WHS, and I wonder how many westerners have visited it before its designation in 2010. The 2009 Lonely Planet Vietnam describes it as a "militairy base" and "closed to the public". News updates on the web that I had read up on before said that it had opened for a while last year, and then closed again for renovations. So I had no idea of what to expect when I set out to find it. The entrance to the citadel, the main part of the WHS, turned out to be pretty inconspicuous: you surely would not go in if you weren't looking for it. It is located around the corner from the Red Flag Tower, and most signs pointing to it are in Vietnamese. While the nearby Ho Chi Minh Mausoleum sees thousands of domestic and foreign visitors a day, here I encountered only about a dozen Vietnamese. Entrance is free and a visit (at least my one did) lasts about an hour. What you'll find here is a number of gates and buildings, all in yellow and most of them originating from the 19th century. The site is hard to date for our "Built in the xth century"-connection, as Thang Long's status as capital lasts from as early as 1010. Most structures here have been rebuilt however during the course of time. I did not visit the Archeological Site, which is located across the street from the citadel. It has very limited opening hours (a couple of hours a day in weekends), and was closed when I arrived there. Seeing the state of the remains, it is doubtful if this is a worthy WHS. Hanoi got this status last year as a present for its 1000th birthday, after a clever nomination from the Vietnamese. It compares itself to Nara (Japan) and Xi'an (China), but its remains are much less imposing. The lovely capital of Vietnam surely merits international attention though, especially for its Old Quarter (which is about 2 km away from the citadel). Now I don't mind near misses as much when it's a great site or at least a good one. For instance, as a kid we went both to Cornwall and Devon. I am not sure if we visited any of the inscribed areas; I only recall the sunny beach and the nice waves. And frankly, I really look forward to travelling there a second time 30 years later. It's an entirely different thing, if the site is mediocre at best. As other reviewers have pointed out this is a really "doubtful" inscription asking themselves "why this site has been added". To put it bluntly: The site isn't that old, original or oustanding. In Vietnam itself you have Hue which is a way better site from mostly the same period. And even if you feel Thang Long warrants an inscription I would argue that the site was not ready when it was inscribed. To this day (8 years later) they are still carrying out basic preservation work while a big chunk of the site is off limits due to the Vietnamese military using the compound as base. The ongoing use obviously also impairs preservation efforts. In any case, I used a 21 hour layover in Hanoi travelling from Guangzhou to Luang Prabang to tick it off. While I did not much appreciate the site itself, coming back to Vietnam and spending a few hours in the streets of Hanoi was fun and much appreciated. Thang Long is right in the middle of Hanoi. I walked there from my hotel in the old town. Be mindful, though, that Vietnamese road crossings are challenging and the traffic chaotic to put it nicely. As I was short on time I appreciated that the site opens at 8 a.m. I think I managed to get in a bit before that. It nowadays isn't free anymore but costs 30000 VND. Most of the site can be seen from the outside, so you could ignore the opening hours and save the entry if you wanted to. The Vietnamese have also started putting signs everywhere, so it's hard to miss. Seeing this was only a layover stop on my way to Laos I headed back to the airport after having visited the site. I had checked my luggage directly to the final destination and was only carrying light luggage. Bus 86 stops pretty close to the site and takes you to the airport for 35000 VND. Maps.me has the proper location. Lucky me, both my passports afforded me visa free entry to Vietnam. While Thang Long is not much to call home about, Hanoi is a wonderful city with plenty of temples, Communist sites and French colonial buildings. Pertsonally, I think specifically the French Colonial buildings would warrant an inscription, but understand if the Vietnamese are reluctant on the subject. Excursions to Halong Bay and Trang An (Ninh Binh) can be arranged in Hanoi at most hotels. Both are definitively superior world heritage sites than Thang Long. To be honest, I’m not really sure why this site has been added to the World Heritage List. I read one suggestion that it was a ‘gift’ from UNESCO for Hanoi’s 1000th birthday. I think that’s unlikely but it does make you wonder how some of these decisions are made. Despite the long and fascinating history of the site, there is so little to actually see today. There are lots of buildings - but they are new and have nothing to do with the listing. There is an archaeological site that is probably the most important part of the site, from a heritage perspective, but there's not much to see there yet. The dig site is across the road from the main buildings and would be easy for a visitor to miss if they didn’t know where it was or how to get to it. It’s a large space, protected from the elements by a temporary roof, with a few workers sifting through the dirt and cleaning the items they find. You can see the foundations of buildings here and there are, presumably, important artefacts buried. I went Thang Long citadel on late Feb 2012. Before arriving Vietnam I tried to search the information and location. It was quite difficult. It is one of the underrated WHS in Vietnam. Thang Long citadel remained some foundations that not outstanding. However, I like the exhibition. Another underrated WHS is the latest... Citadel of Ho Dynasty in Tranh Hoa province. You can see this place from my blog. I visited this WHS in February 2011. The highlight of my visit were the turtle stelae of the imperial citadel in the lower Red River Valley. This archaeological site reflects a unique SE Asian culture at the crossroads between China and Thailand. 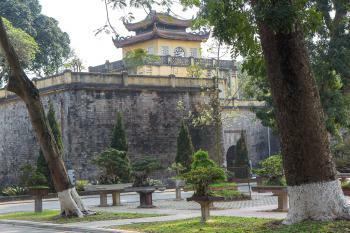 The imperial city of Thang Long is situated in the historic center of Hanoi. Thang Long was actually the historic name of Hanoi before colonialism. It is composed of two sites; the first one is a complex comprising different nice buildings and the citadel with its famous tower. The other one, situated very close (cross the road), is an archeological park where buildings and antiquities are getting excavated. This place is interesting to see how people excavate things and how deep in the ground it can be. The imperial city has more than ten centuries of history and several dynasties used to live in. It was also welcoming ritual ceremonies. The site is not well indicated. It is situated just close to the statue of Lenin, midway between the old quarter and Ho Chi Minh mausoleum. The entrance is free but take care of the time. In 2008, I visited Hanoi with no expectation as my prime interest was the famous Ha Long Bay, but I also made a sightseeing tour to many places; apart from the beautiful Hoan Kiem pond in the city center, I also visited many temples such as Van Mieu, and Ho Chi Minh Mausoleum and its museum. I thought I had seen all the must see of Hanoi which in my opinion except Ho Chi Minh’s, the historic sites in Hanoi were just fine with no significant or unique. When I saw the news that Hanoi Citadel became a WHS, I had to raise my eyebrows to question that “Am I able to count that I have been?” When I visited, the Citadel was still closed to the public as it was the military barrack and no tourist information, after checking with the nomination paper, the site was separated into two parts, the Citadel and the archeological zone. The only part of citadel I saw was the Flag Tower which actually just located next to the busy road to the Mausoleum with many tree blocking the view; however, for me the eye catching statue of Lenin opposite the Tower was much more interesting as its evidenced that I were in communist country. The archeological site location was much more shocking, it was located next to the Ba Dinh Square, which is the Red Square of Hanoi, opposite the mausoleum of Uncle Ho, similar to the GUM with Lenin Mausoleum in Moscow! I only wondered who on earth will notice the existence of this archaeological site. 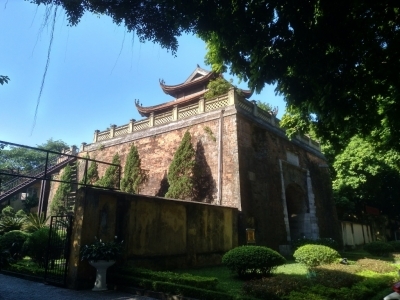 Also the buffer zone of the citadel covered not only the mausoleum, but the museum, presidential palace or actually all important political places of Vietnam. The nomination document emphasized that the citadel was the political center of Vietnam in ancient time, with respect from the buffer zone map, the document should change to the citadel and its nearby area is still the political center of this country. If we count buffer zone is a part of WHS area, seem to be that all tourists, who visit Ba Dinh Square, have visited WHS without notice the significant at all! However I was quite happy that at least I saw the flag tower which made me able to proudly say that I have been to the “Central Sector of the Imperial Citadel of Thang Long – Hanoi” even though I did not feel like I did it at all! ICOMOS advised Deferral, "Reconsider the definition of the property so as to give it a material and cultural basis that demonstrates precise attributes"
Tunnels: The Vietnamese military command under General Giap, had its headquarters in the citadel in the building known as D67. An underground tunnel enabled the military to flee to other parts in case of a raid. Inscribed in connection with an anniversary: Inscribed 2010. The 1000 year anniversary of Hanoi's foundation fell in 2010. Northern Vietnam Hotspot: Hanoi is ca. 1.5 hour by bus from Ninh Binh. Allow another half hour to reach Thang Long in the city center. 127 Community Members have visited.